Arrpirate pubblica un ennesimo homebrew-clone di Tetris chiamato OMG WTF (personalmente lo giocherei anche solo per il nome), il quale presenta diverse modalita' originali che lo distinguono dalla versione classica. Traditional Game Mode: This is the tradition Tetris-like game mode. It's simple. Just try to survive as long as possible by clearing lines on the screen. Clear Limit Mode: In this game mode you try to clear a certain amount of lines in as little time as possible. 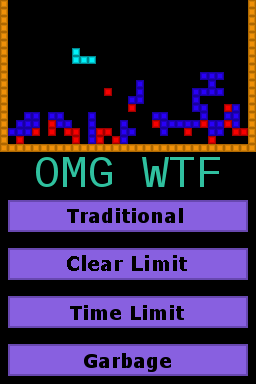 Time Limit Mode: In this game mode you try to clear as many lines as you can in a certain amount of time. 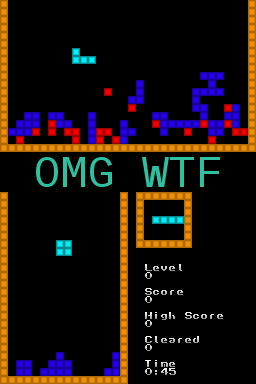 Garbage Mode:In this game mode the play area is populated with 'garbage' pieces, red blocks that must be eliminated in order to make it to the next level. Music: There are around 20 jazz hits from the 1920s, my favorite music genre and era. Tutto sommato ottimo lavoro, e sicuramente grande impegno da parte di Arrpirate. Da giocarci solo per il nome!! Peccao che ora ho il DS strapieno ! !